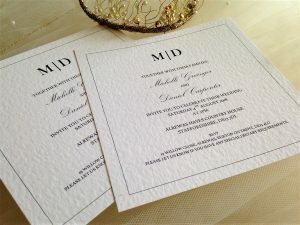 How should the invitations be worded if the brides’ parents are divorced, but nevertheless are co-hosting the wedding? Mr Charles Robson and Mrs. Cole request the pleasure of your company at the marriage of their daughter Suzanne to Mr Simon Jones at St. Marks Church, Fulham on Saturday, 17th August 2018 at 3 o’ clock and afterwards at Holland House Hotel, Fulham. How should the invitations be worded if the bride’s parents have re-married (non-amicable parting-of-ways)? Should the bride’s parents send an invite to the groom’s parents? If you have sent a ‘save the date’ card and been informed that the guests can’t make the wedding, do you still send them an invite? How far in advance do you send ‘save the date’ cards and wedding invitations? ‘Save the date’ cards: 6-8 months in advance. Wedding invitations: 10-12 weeks in advance. Aside from the ‘save the date’ cards, invitation and RSVP cards, is there any other stationery items you need to think about? Yes, it’s a good idea to order the following stationery items once you know who is attending. Obvious items: Order of Service, Menu, Place Names, Thank You cards. This article wedding invitation wording was brought to you by Daisy Chain Invites, suppliers of affordable wedding invitations and wedding stationery printed in the UK.